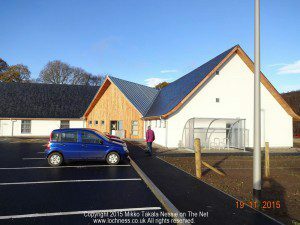 Villagers got a chance for a look behind the scenes as the finishing touches are put to our spanking brand new Drumnadrochit Health Centre. It is a wonderful example of fine architecture and design – from the heated wooden floors to the low energy LED lighting, spacious naturally lit rooms and a biomass boiler heating system. 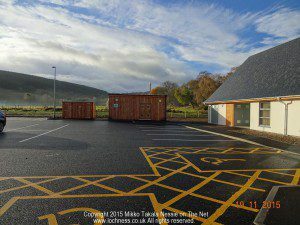 The new centre has more than enough space to cope with the existing population of Drumnadrochit, Lewiston, Milton and the outlying communities. However, plans are already on the drawing board for increased housing at the village and this new facility has a full length roof space, pre-trussed and ready to be easily converted into more accommodation as needed. 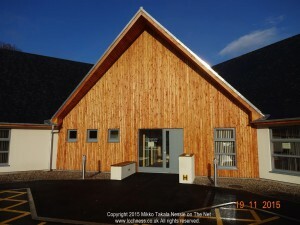 Here is a link to our old Surgery. It has served the community very well over many years but is now just too small with no possibility for incorporating modern medical advances. But we are all more than grateful for its years of good service. If you are interested to read more about the biomass heating system, here is a link to an article with more photos inside the boiler house and the centre. Also, while the ground was being dug in preparation for the new health centre, archaeologists uncovered a Bronze Age Cist Burial Site. You can read about that amazing discovery here. Irish man spots Nessie for second time on our webcam! Japanese TV Visits Us & Solves Nessie!